OH Gamma Brother Robert Lester Tavenner was commissioned a second lieutenant and infantry officer in the U.S. Army on this date, and went on to serve in France and Belgium during WWI. At OSU, Brother Tavenner was Junior Class President and Captain of the Company of Cadets. World War I, World War II and Korean War Veteran, Hero of Bastogne, SigEp Citation Recipient and WV Beta Brother General Anthony Clement “NUTS!” McAuliffe, U.S. Army (Retired) died on this date in Chevy Chase, Maryland at the age of 77. He was laid to rest with full military honors at Arlington National Cemetery in Section 3, Site 2536. Born in Washington, DC in 1898, Brother McAuliffe was a student at West Virginia University from 1916 to 1917, before attending and graduated from West Point in NOV 1918. He rose through the ranks from second lieutenant in 1918 to his promotion to four-star general in 1955. On D-Day, Brother McAuliffe was serving as Commander of Division Artillery of the 101st Airborne Division when he parachuted into Normandy. He subsequently entered Holland during Operation MARKET GARDEN in a military glider. 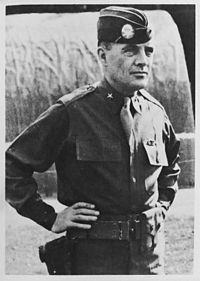 In DEC 1944, when the German army launched the surprise Battle of the Bulge, General Maxwell D. Taylor, commander of the 101st Airborne Division, was away, attending a staff conference in the United States. In Taylor's absence, acting command of the 101st and its attached troops fell to (then) Brigadier General McAuliffe. At Bastogne, the 101st was besieged by a far-larger force of Germans under the command of General Heinrich Freiherr von Lüttwitz. In the 1997, the NUTS! McAuliffe Society was formed and consists of extremely dedicated volunteers. The current NUTS! Brigadier General is IN Epsilon Brother John Stumpf. A southern extension of Route 33 in eastern Northampton County, Pennsylvania, completed in 2002, was named the General Anthony Clement McAuliffe 101st Airborne Memorial Highway, and in 2009 the post headquarters building at Fort Campbell, Kentucky opened and was re-named McAuliffe Hall. World War II Veteran and NC Delta Brother Staff Sergeant Clifton Robert “Tip” Faucette, Jr., U.S. Army died on this date. He was 88 years old. Tip served as an Army medic during WWII. Respect can be paid to Brother Clifton at Mountain View Cemetery, Ridgeway, Virginia. U.S. Army Korean War Veteran PA Epsilon Brother Philip J. Sievering Jr. died on this date in Berkeley Heights, New Jersey. VA Pi Brother Captain Robert May, U.S. Army retired on this date. TN Beta Brother Fred Avil Allen III, U.S. Coast Guard Auxiliary died on this date. Fred was always proud to have earned Eagle Scout status and was a member of Sigma Phi Epsilon fraternity in college. 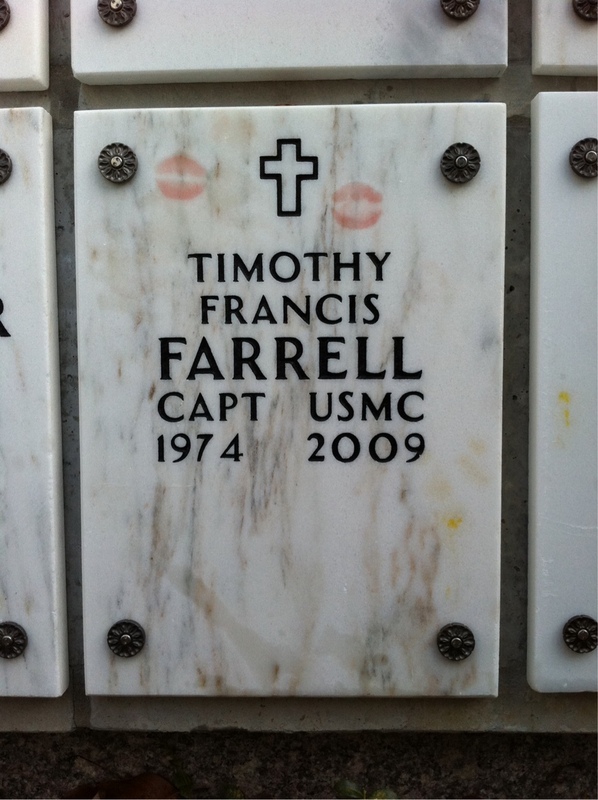 On this date, NH Alpha Brother Captain Timothy Francis Farrell, U.S. Marine Corps died in Frankfurt, Germany while working for the State Department as Vice-Consul in the U.S. Consulate General in Frankfurt. He was 35 years old. After graduating from Dartmouth, Brother Farrell joined the Marine Corps in 1997, and was a decorated Marine stationed in San Diego, deployed to Japan and the Mideast. He also served on the USS Harpers Ferry (LSD-49) as a logistics officer. At Dartmouth, Brother Farrell was a member of the track team, and a four year recipient of the Inter-Collegiate Association of Amateur Athletes of America (ICAAAA). He was also elected to the All-Ivy League Team, First Team, in 1992-1993 and 1994-1995. In 1995, he received the prestigious Nathan D. Bugbee 1925 Track Prize. 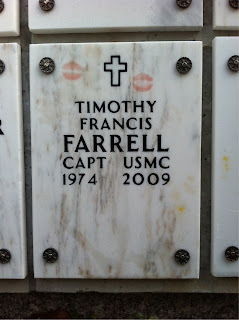 Brother Farrell joined Brother McAuliffe and more than 25 other SigEp Patriots known to be laid to rest at Arlington National Cemetery (Section 7-B, Row 4, SITE 1). * U.S. Air Force Korean War Veteran and OH Epsilon Brother Harold “Hal” Walker Look, Jr., 83, passed away 21 JUL after a period of declining health. In lieu of flowers, donations may be made to Rockland Congregational Church Abiding Memorial Fund, PO Box 554, Rockland, ME 04841, or the charity of one’s choice. * Korean War Veteran and IN Gamma Brother Richard Matthew Worthman, 80, passed away 27 JUL in Indianapolis, Indiana. * Yesterday, U.S. Army World War II Veteran and Prisoner of War PA Delta Brother Edgar A. Waite, Jr. was laid to rest at Hillside Cemetery, Roslyn. He passed away peacefully at home on 05 AUG 2013. In lieu of flowers memorial contributions may be made to: Liberty Bell Chapter of America Ex POW, 61 New Pond Lane, Levittown PA, 19054-3819 or to the Alzheimer's Association, 100 N 17th Street, Philadelphia, PA 19103. Our thoughts and prayers go out to the family, friends and chapter brothers of SigEp Patriots Look, Worthman and Waite. While they are no longer with us, SPP pledges they will always be remembered. * 06 AUG – U.S. Army First Lieutenants CA Theta Brother Adam Wilson, KS Beta Brother Matt Cavanaugh and VA Omicron Brother Andy Ryan learned they had been selected for promotion to Captain. Congratulations to Brothers Wilson, Cavanaugh and Ryan! * This week – Operation IRAQI FREEDOM Veteran AL Theta Brother Lieutenant Colonel John Hopson, U.S. Army (Retired) received the Volunteer Excellence Award from the MO Eta Alumni Volunteer Corporation.